We aim to never profiteer on postage, choosing only to pass on the exact rate of postage charged by us onto the customer inclusive of VAT. I’m proud to say that we’ve never had a parcel lost yet (although one or two may have have gone the scenic route!). If you want to save on delivery, why not come and see us at one of our trade shows? Please note, at present our website isn’t able to automatically calculate postage. Therefore we require you to select the correct delivery method at the checkout. All items are dispatched same day Monday to Friday if ordered before 2pm. The exception to this is if we are attending a trade show which may mean there might be a small delay in dispatching your order. If this is the case, there will be a message explaining when you can expect to receive your delivery on the Checkout Page. If you need any more information you can contact us. We send many packages out to European camp sites each week via Royal Mail International Signed For and UPS Courier. Please check with your camp site reception that they are happy to accept a parcel on your behalf and confirm the delivery address with them and if they would like your name or pitch number displayed. This service takes from 5-10 working days but in experience parcels usually arrive within 7 days. If you wish to have your item delivered to your camp site we recommend contacting us via e-mail. If possible please contact us before placing the order and we will advise the best way to do so. If you check out via the website, don’t use your PayPal account – instead use your credit or debit card so that you can specify the correct address. Delivery by Royal Mail using the 1st Class Delivery service. No tracking information is available with this delivery and we recommend that items over £50 in value be sent via Recorded. Most items sent via this method arrive next day, although could take upto 3 days. Please be aware should an item fail to arrive we would need to ask you to wait the 15 days required by Royal Mail before a package can be declared as lost. Please do consider the recorded option. Delivery by Royal Mail using the 1st Class Recorded Delivery Service. This requires a signature on receipt and is recommended for items over £50 in value. Most items sent via this method arrive next day, although could take upto 3 days. The Special Delivery service Guarantees your delivery for the next working day before 1pm. Please do check on the Checkout Page that we’re not exhibiting at a trade show which may delay your order. Trackable within the UK, insured and signed for delivery to anywhere in mainland Europe. We’ve sent 1000’s of items via this method and found it to be totally reliable with a 100% delivery rate. Packages usually arrive within 7 working days but may be slightly longer depending on local delivery arrangements. Fully tracked from collection, insured and signed for on delivery anywhere in the UK or Mainland Europe. We started to offer this service in 2014 and have a 100% delivery success rate. Scheduled delivery available and fully trackable. Packages send via this method within Europe are usually delivered within 5 working days. At present we accept PayPal for our web based payment processing. 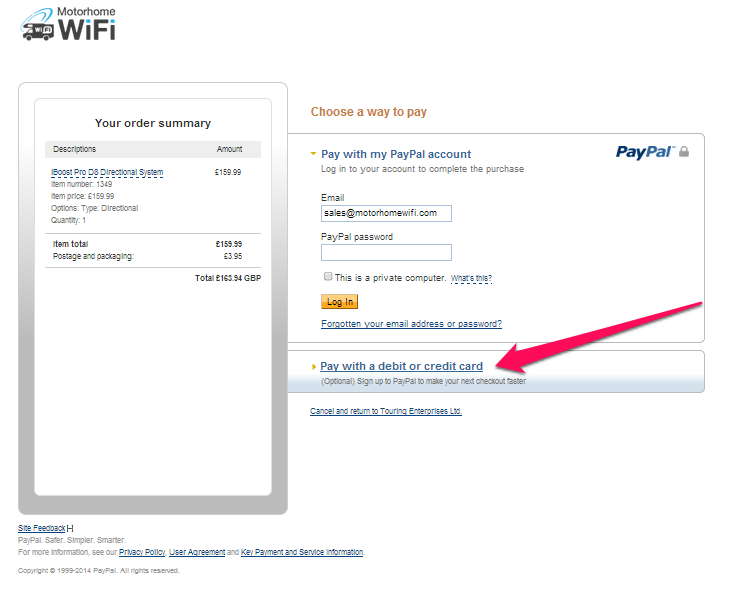 You do not need to sign up to or log into a PayPal account in order to check out – simply choose “Pay with Debit or Credit Card” underneath the box to sign in after you leave our site via the ‘Checkout with PayPal’ option. Alternatively we can accept all card payments including AMEX over the phone, please contact us on 0113 815 1120 for more information. We do not store any of your credit card details on file.